The Kimball Union Academy boys’ lacrosse team played their first game in May, 1938, a 6-5 victory over the Dartmouth Freshmen team. During its storied history, the Wildcat program has continued to grow and prosper. Kimball Union now competes against many of the top programs in the northeast. A strong sense of tradition and excellence connect the players today to those that paved the road to success before them. Someof the games’ greatest, including legendary Syracuse coach Roy Simmons, Jr, played high school lacrosse at The Academy. The Wildcats compete in the competitive Northern New England Prep School Lacrosse League. Traditional rivals include many of the top Prep School programs in the country, such as New Hampton, Exeter, Northfield Mt. Hermon, Brewster, Tabor, and Holderness. KUA has earned two Lakes Region Championships since 2008. During this time, the Wildcats have graduated three All-Americans, three Academic All-Americans, and one Northern New England Player of the year. Six players have competed in the prestigious East-West New England Prep School All-Star Game. Cushing came out firing on Saturday, jumping out to a 2-goal lead over KUA. Dominic Carter scored twice and Jay Chubb once to give KUA a 3-2 goal lead at the end of the first quarter. Things fell apart in the second quarter as The Wildcats fell apart defensively and in the clearing game giving up six unanswered goals. Sophomore Reed Doucevicz opened the second half with his first career goal to narrow the score to 9-4, but that is as close as KUA would get. Will Kezerian, Peyton Ceppetelli and Colter Lingleback-Pierce scored late for KUA and goalie Kobi Lees did a nice job coming off the bench. KUA is now 5-2 on the season and hosts the four-time defending champs, New Hampton, on Wednesday 2:30 pm. Nick joined Kimball Union Academy in 2015 as an Associate Director of Admission and the Boys’ Varsity Lacrosse Coach. Before moving to Meriden, NH, Nick spent eleven years working in the Admission Office at Portsmouth Abbey School. During his time in Rhode Island Nick coached varsity lacrosse and hockey, in addition to being a dorm head for ninth grade boys. Nick is from Baltimore, Maryland. He attended Loyola Blakefield where he was the captain of the hockey and lacrosse teams during his senior year. Nick continued his lacrosse career at the University of Notre Dame where he was an accounting major and a goalie on the 1st Notre Dame team to reach the Final Four. After graduating in College in 2003 Nick helped coach Cape Henry Collegiate School to their first ever state championship. While an assistant at Portsmouth Abbey, the lacrosse team won nine league championships in eleven years and three goaltenders were named U.S. Lacrosse All-Americans. In 2014, Nick earned his Masters’ in Athletic Administration from Ohio University. Nick’s wife, Polly, works in the Advancement Office at Kimball Union Academy. Nick and Polly live on campus in Rowe House where they are co-dorm heads; along with their two daughters Carter and Gracie. Lochrane joined Kimball Union Academy in 2018. 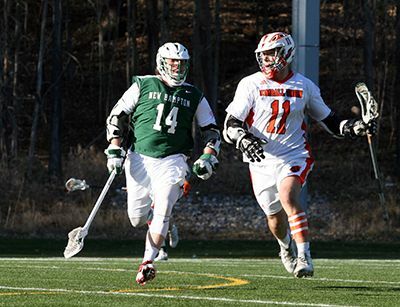 He is currently serving roles as the assistant coach for the boys Varsity Lacrosse team and as an instructor for KUA’s Strength & Conditioning class. Lochrane is also a personal trainer at The River Valley Club in Lebanon, NH. During his time in New Hampshire, he spent three seasons as the boys’ Varsity Lacrosse head coach at Lebanon High School. Lochrane is from Orlando, FL. He attended Florida State University where he received a degree in Business Management, and played club Lacrosse. During his time there, he was a team captain and Face-Off Specialist, and FSU was able to capture their first conference championship and earned a bid to the National Tournament. After graduating in 2007, Lochrane began coaching high school and youth programs. He moved to NH in 2012. During his time at Lebanon High School, the team made their first playoff appearance in five years, and three of his athletes were named to All-State honors. Lochrane and his wife, Kristen, live in Lebanon with their two children, Cameron and Tanner.